Hibiscus plants have large, beautiful flowers and are excellent choices for hummingbird gardens and areas that have fountains or small ponds. These plants, which can reach heights of up to twelve feet, come in many different colors and bloom from July until the first frost. The Blue Princess of the Verbena family is right at home in the Texas heat. This plant prefers full sun and will produce abundant flowers with the proper care. The blooms are a vibrant blue and nicely complement other brightly colored flowers. Like most petunia varieties, the Dwarf Mexican Petunia fares quite well in both wet and dry soils. The blooms produced by this plant are available in a variety of colors and are most abundant when the plant receives full sunlight. Japanese Maples grow well in heavily shaded areas and thrive in the North Texas climate. They come in many different shades of red and orange, fitting in well with gardens that have brighter colored flowering plants and shrubs. Japanese maple trees are ideal for smaller home gardens or natural landscapes because of their small height and slender trunk. The Texas Lavender Vitex Tree has become a common addition to many Dallas/Fort Worth gardens. Also known as a Chaste tree, the Vitex is considered a superstar of Texas foliage. It flourishes in the hot North Texas climate and produces an abundance of flowers during the early summer months. It will continue to bloom throughout the summer months and into the fall. Of all the plants in the Myrtle family, the Crape Myrtle is the most commonly used in Fort Worth area gardens. These trees can grow to about 17 feet in height and will explode with one of many different shades of vibrant flowers come spring. The trees thrive in the hot climate of North Texas and are a common choice for public gardens and medians because of their wide variety of colors and ability to adapt to their surroundings. Salvia plants are available in a wide array of colors and are the easiest plants to grow in the North Texas heat. The plants are drought resistant and consistently attract hummingbirds. From the bright purple of the farinacea variety to the brilliant blue of the longispicata, the blooms can add the perfect splash of color to your garden. Grandma’s yellow rose stands out amongst native Texas flowers. It produces large, hardy blooms that remain abundant until the hard frosts first appear. The flowers are very fragrant and are ideal for floral arrangements. Many Dallas/Fort Worth gardeners consider the yellow rose to be a staple in any native landscape or garden. The Lacey Oak is one of the smaller oaks, topping out at less than 30 feet tall. Similar to the miniature white oak, this tree provides an abundance of shade and is an extremely popular choice for home gardens. The Lacey Oak is known to be both drought and heat resistant, and it thrives in the Dallas/Fort Worth climate. It’s a beautiful addition to any garden or natural landscape. While dogwood trees can be somewhat temperamental in the Texas heat and humidity, once they firmly take root, they often thrive. Dogwoods and Myrtles go well together, but they both need proper care to make it through the first two or three years. The blooms and size of the dogwood make it a great addition to residential gardens. The heat, humidity, and drought conditions of the Dallas/Fort Worth area are often too harsh for non-native plants. 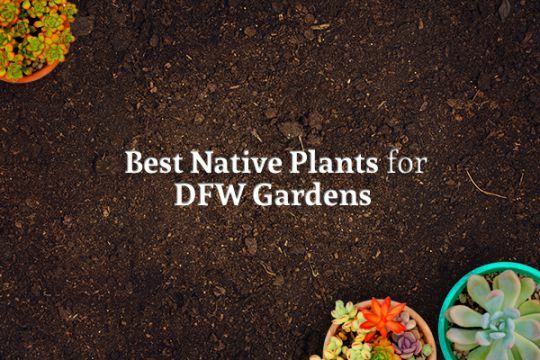 The good news is that there are several varieties of plants that are native to Texas which will thrive in your North Texas garden. You can mix and match several different varieties and create a one-of-a-kind home garden that will not only beautify your home, but also create a peaceful oasis you can retire to if you want to relax. Contact Landscape by Design to find out what plants would work best in your Fort Worth garden.